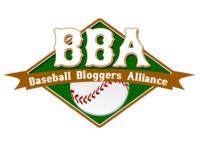 Every season, baseball bloggers across the web vote for their choices in the five award categories delineated by the Baseball Bloggers Alliance: the Connie Mack Award for best managers in each league; the Willie Mays Award for the best rookies; the Goose Gossage Award for best relievers; the Walter Johnson Award for best pitchers and the Stan Musial Award for best overall players. Bloggers in each chapter choose their chapter's votes, and then the votes of each chapter are tallied to determine the final winners. These are the results of those votes. I don't take this award too seriously, since I don't think we have a good way of determining manager value as of yet. Mike Redmond received no votes. This surprises me. I totally flubbed the WMA vote, so best to ignore my choices. That said, Ken Giles had a helluva season and deserved more than six votes (out of a possible 108). Craig Kimbrel led the NL in saves; he trailed Melancon, Tony Watson (PIT, NL) or Aroldis Chapman in everything else. The only reason for Kimbrel to win this year's NL Goose Gossage Award is an antiquated focus on saves or simple inertia (he won the last three years). That Tony Watson recorded 0 votes and Mark Melancon only seven (out of 117) tells me that most bloggers simply missed the great year the Bucs' pen enjoyed. My thought: I could have gone either way between King Felix and Kluber. I respect this outcome. A pox on my General Chapter colleagues for leaving Kershaw off so many ballots. It's Best Player, not Best Hitter. Look, Jose Altuve's a hell of a lot of fun to watch and a very good player. There's just no way he's the NL's tenth best player. FWIW, FanGraphs ranks him 14th among AL hitters. Throw in pitchers and he drops to #20. Very good, fun to watch, but not top ten.